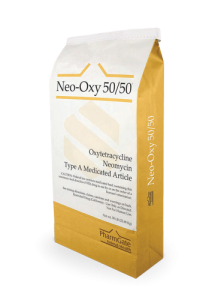 Broad-spectrum oxytetracycline is readily absorbed, providing effective blood and lung tissue concentrations. 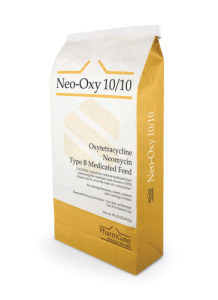 Neomycin generally stays in the gut, providing activity against enteric pathogens. Convenient, cost-effective treatment option vs injectable therapy or other antimicrobial combinations. 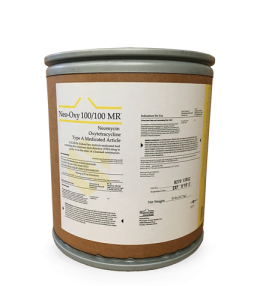 Free-flowing formulation promotes consistent mixing. Color-coded bag for easy identification. Each pound of premix contains 10 grams of oxytetracycline activity and 10 grams of neomycin sulfate. Each pound of premix contains 50 grams of oxytetracycline activity and 50 grams of neomycin sulfate. Each pound of powder contains 100 grams of oxytetracycline activity.